Like 2010, Brett thought its smart to travel to Kona with a little stop-over in China to participate at the Asian Championships and ITU LD Triathlon World Series in Weihai. The race itselfs was well organized and with a little change on the bike course even more challenging then the years before. Several steep and long hills on the bike separated the field pretty quick as the 4 loop run cours wasn`t easy as well. I love challenging racecourses, so that suit me perfect. Behind Camilla out of the water I took the lead on the bike and enlarge my lead in the run to a 13min-lead win. It was good to have an other little “test”. With another win and a enough confidence in my pocket, I cross over to the Big Island. Very happy !!! Also congrats to my team mate Farlow for his fantastic 3rd place. Enjoy your time back in Australia with your family. Wie vor zwei Jahren gewann die aktuelle Triathlon Langdistanzweltmeisterin Caroline Steffen den ITU Langdistanz Triathlon in Weihai (China). Steffen lag im Schwimmen knapp hinter der nachmaligen zweiten Camilla Pedersen (Dä), und dominierte danach sowohl den Radabschnitt (9 Minuten Vorsprung) als auch das Laufen, in dem sie den Vorsprung auf insgesamt rund 13 Minuten vergrösserte. Weihai (China). 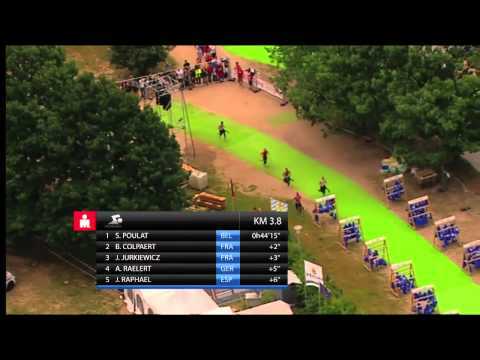 ITU Langdistanz Triathlon. 3 km Schwimmen, 80 km Radfahren, 20 km Laufen. 1. Nikolay Yaroshenko (Russ) 4:12:07. 2. Jens Toft (Dä) 0:25 Minuten zurück. 3. Aaron Farlow (Au) 8:30. 1. Caroline Steffen (Sz) 4:31:34. 2. Camilla Pedersen (Dä) 12:56. 3. Ewa Bugdol (Pol) 15:40. Die Triathlon-Weltmeisterin und mehrfache Ironman-Gewinnerin fährt mit dem Auto und dem Velo etwa gleichviel – nämlich 16 000 Kilometer pro Jahr! was an Opel Corsa 1.2L in dark blue. maybe 16 000 kilometers per year – about the same as with the bike. The car I need to visit my family in Spiez. a few maps, CDs and a set of plastic cutlery. the navigation device and the coffee cup holder. blue as my first car. an old-or classic cars from the 1970s or 1980s. anything that does not belong on the street. “Gopfridstutz”, accompanied by a big hit with my fist on the steering wheel. I parked my car (automatic) but forgot to place the shift on “P”. When I returned from the bakery, the car was in the middle of the street. because for me it means independence and I can sing as loud as I like and no one hears me. war ein Opel Corsa 1.2L in Dunkelblau. rund 16 000 Kilometer pro Jahr – etwa gleichviel wie mit dem Fahrrad. Das Auto brauche ich, um zwischendurch mal meine Eltern in Spiez zu besuchen. ein paar Landkarten, CDs und ein Set Plastikbesteck. das Navigationsgerät und der Kaffeebecherhalter. blau wie mein erstes Auto. ein Old- oder Youngtimer aus den 1970er oder 1980er Jahren. alles, was nicht auf die Strasse gehört. ist «Gopfridstutz», begleitet von einem kräftigen Fausthieb aufs Lenkrad. war, als ich das Auto (ein Automat) beim Parkieren nicht auf «P» gestellt habe. Als ich aus der Bäckerei zurückkam, stand das Auto mitten auf der Strasse. zu schön, um zu teilen. weil es für mich Unabhängigkeit bedeutet und ich darin lautstark singen kann, ohne dass mich jemand hört. Caroline Steffen was born in Spiez and began her early competitive career as a swimmer. She enjoyed success as a swimmer competing on the Swiss junior and senior national teams and winning multiple national titles. In 2002, Steffen underwent shoulder surgery and would eventually retire from competitive swimming afterwards. After taking some time off Steffen competed in a two-day Swiss multisport competition, the Gigathlon, which reignited her desire to compete and train again. In 2006, after having completed a few Olympic distance triathlons she entered and placed second in her age group at Ironman Switzerland, posting a sub-10 hour time. She went on to compete at the 2006 Ironman World Championships in Hawai’i where she posted another sub-10 hour time and placed third in her age group as an amateur. In 2009, Steffen took fourth place the Ironman 70.3 World Championships in Clearwater, Florida. A few months later she won her first major race, the Ironman 70.3 in Geelong in February 2010. She highlighted 2010 with a win at the ITU Long Distance Triathlon World Championships and a second place at the Ironman World Championships. Grueling (some severe climbs on the bikecourse) it may be, but for Caroline Steffen (SUI) she once again demonstrated pure class to lead from start to finish. Steffen has been on quite a winning streak this year, getting faster and stronger with each race. When did you first start training in life? Where and why? When: I was 12, swam once a week with my swim squad. Where: in Spiez (Switzerland). Why: I was allowed to leave the school 15min earlier to catch the bus – reason enough to start my swim career. One sport wasn’t enough? What got your into the multi-sport arena? It was a two days adventure race in 2005 which brought me closer to the triathlon, specifically to the long distance. It was 2009 after crossing the finish line at the Ironman Port Macquarie. My partner David gave me a hug and said: “ you have the potential to be a PRO”. What are the events, wins, memories that stand out most throughout your career so far? It was my 2nd place at the Ironman World Championships in Hawaii 2010 – It felt like I won the race. What is your best discipline and why? If you had a discipline that needed work, which would it be and why? Transition 2 – still can’t figure out why, but I always lose so much time jumping from my bike into my On running shoes. If there is one thing that people in the industry would recognize you by, what would that be? What has driven you to work super hard and rise up beyond mediocrity? I learned quickly, hard work is rewarded with success and unique emotions. Are you a rebel? Why or why not? I`m a rebel and I don’t have a cause. I love Hawaii/Kona. It’s the biggest race of the year and everyone is there to race hard. What is the venue that you purely dread and why? … my best training buddy every single day. If you weren’t killing it in the tri scene, what would you be doing for a living? I would have my own Beach Coffee or Swiss Bakery at the Sunshine Coast, Australia. What is a hidden talent you have other than your sport? My big talent is being late and moving things which I don’t like to do, to the next day. I`m good with numbers/math or creative things. What is the best song to practice to? I`m a big fan of Rammstein. Especially in tough sessions, their songs give me a kind of aggressiveness. If you had to share a hotel room/apartment with one Oakley athlete, who would it NOT be and why? Oh that’s Cadel Evans – he would not get a second of sleep during all my questioning. I`m a big road cycling fan!!! At Cran Ganaria I pass Fabian Cancellara every day on my bike and get so excited every time. I don’t even have the guts to say hello. I’ll try it the next day again … and again … and again. How addicted I am to café and chocolate. At the beach with a “Mooloolaba-Magic” in my hand. Even if it’s hard, never forget to enjoy the moment and be aware not everybody has the privilege to do sport. You are currently browsing the Caroline Steffen’s Blog blog archives for September, 2012.